The S&P 500 looks like it is in a cycle of a rally, followed by consolidation, and then decline. This is similar to the pattern that occurred between late June and early November last year. If that turns out to be the case, the index could see a 5% pullback from its recent high this year going into the middle of March. The 2180 level on the S&P 500 was formidable resistance in the last half of 2016. It rebuffed the 9.5% rally run off the June low that year and sent the index back down to retest its 200-day moving average, a process that took approximately 92 days and included a 4.8% decline. The November 2016 bounce off the 200-day moving average that followed initiated a rally that quickly penetrated that 2180 former resistance level, and continued higher, eventually reaching the 2280 level. This second rally lasted about five or six weeks before it began to stall and saw about a 9.5% gain in the broader market average, just like in the July to November rally. For the last 26 trading sessions, the 2280 level has been providing stubborn resistance. There is talk of the "Trump rally" losing steam, and the Volatility Index (VIX) is at an extremely low level, suggesting trader complacency. 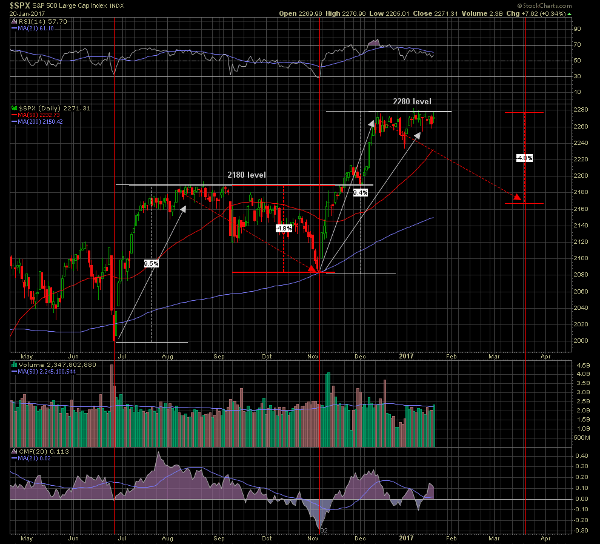 A surprise pullback could be in order. If a second pullback is of similar duration and decline to the one in 2016, it would mean that the low would occur around the middle of March and another potential 4.8% decline would target the 2165 level. The relative strength index has been tracking lower and under its 21-period average, just as it was when the top was forming in August last year. Chaikin money flow is currently above its center line, but it did remain above it for most of the previous pullback period. A more important observation is the steady decline in its signal average. A perfect repeat of the previous rally-and-pullback cycle is not likely, but projecting the possibility fashions a framework in which to evaluate the movement of the S&P 500 going forward and highlights important points in time and price. This article is commentary by an independent contributor. At the time of publication, the author was long SDS.